I research the hell out of our RV destinations, so as to limit the surprises sometimes found when choosing a park out randomly or out of necessity. 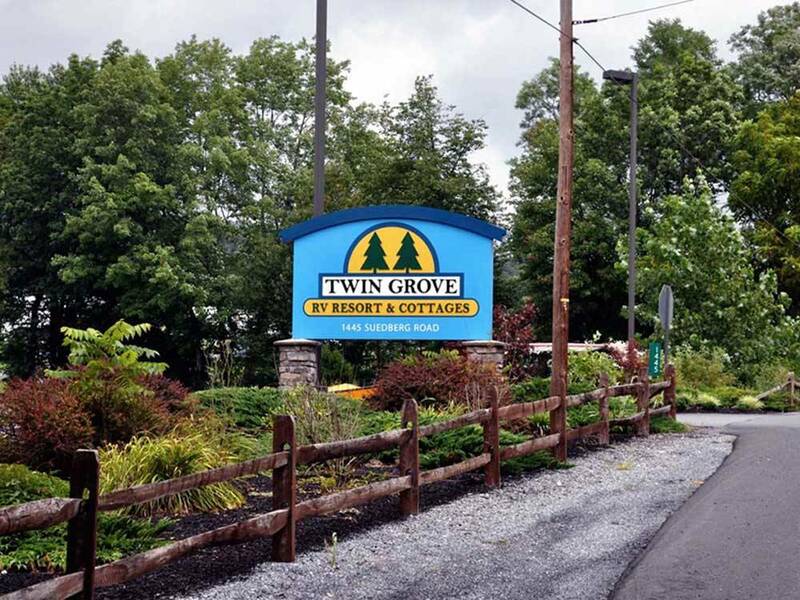 We needed a place in the central PA area, so I used my usual tools and narrowed the list down to Twin Grove, which got really good reviews in Good Sam and RVParkReviews. The park itself is located near nothing…38 miles from the nearest city, Harrisburg, and 5 miles off the I-81 near a lot of small towns and villages. Very rural. I was expecting rustic. Imagine my surprise hen we pulled in to an honest to god RV resort. It’s huge. Cabins, Tent sites, a giant general store and restaurant, two large swimming pools with adult sized water slides and hot tubs. In addition, they have a small carnival area with rides, music and attractions that are opened seasonally on weekends and attract hundreds…from where I don’t know. We had site #G16, a back in on the creek in a very quiet area. Absolutely perfect with our rear window overlooking the babbling brook. Sites were gravel with nice grass in between. In the G area, the sites were very spacious. Utilities were fine, tho placed far to the rear of the site. Wifi was ok. Too many trees for satellite. Staff (lots) were efficient and affable. Twin Grove isn’t “near” anything, so you should pre-provision. A fun day trip is to Pottsville where the Yuengling Brewery (USA’s oldest) offers a great free tour and tasting. A longer daytrip south to Amish country. Try a ride on the Strasburg Railroad for a fun and inexpensive outing on an historic train. This is a great campground. We were just traveling through so only stayed one night. But it is gorgeous there. Great view of the mountains, close to Blue Ridge Parkway, wide, spacious level sites, good newish hookups. Amenities were great, I wish we had planned a month there. Great pool and two giant dog runs. Our herding dog loved it after a day in the truck. This was an excellent campground. Easy in / easy out, very comfortable homey feeling. We are a retired couple and enjoyed walking around the park, watching the kids on the rides, getting ice cream at the parlor, enjoying the on-site restaurant. We would definitely stay again. Wonderful campground with lots of activities and facilities to explore. The BEST private bathrooms we've encountered in our travels. Beautiful overall campground. Very well kept. It's not directly off the interstate which we like when just traveling thru. However the short drive was fun and pretty. The only reason I'm not giving 5 stars is the area we were in on the right side of the park the sites weren't that level. I think it just needs to be regraded. But the views were amazing!!! And everything was closed down by 6:00 pm! After traveling all day it would have been nice to go to the restaurant or ice cream shop on the property. This will be on our return list. We stayed for a week. The park was very well maintained. The sites are large and level and the staff were very friendly and helpful. Would definitely stay there again. This is one of those campgrounds that made us feel like we are in the right place! We arrived slightly after hours and our paperwork was there with clear instructions to our site. Our site was next to the bathroom as requested. The site was level and very clean and tidy! The view was picturesque with rolling hills surrounding us on every side. Everything about this campground was clean and neat. Bathrooms were spotless! The staff was always around and very friendly. If it wasn't so windy we would have enjoyed playing the frisbee golf course... a nice touch! We were off peak and mid week so the restaurant and ice cream parlor and park amusement rides, were not operational. Walking thru this large campground... we found it to be clean and neat... with staff working on various projects. I am glad we found this campground... this should be a model of standards for all resort type campgrounds! This was our 4th October visit and we will be back. Always pleasant, fast and easy check-in (all papers waiting for you at the gate on Friday afternoon), nice size pull-thru sites. We have stayed there overnight on our way to Florida 3 years in a row now. Open all year with winter water and drive thru sites. A little bit of drive off the highway (approx. 5 miles) but very quiet at the beginning of march. Washrooms were clean and warm. No issues with Staff or booking a site. in fact we have never met them in person as we arrive late and leave early. Paperwork is always waiting for us and drive thru sites are easy to use which is a big plus after a long days drive and when you're pushing 65 feet in length. It looks like it would be a nice place in the summer, its hard to tell as its been covered in snow every time we've been there. We will be back this year on our way down. 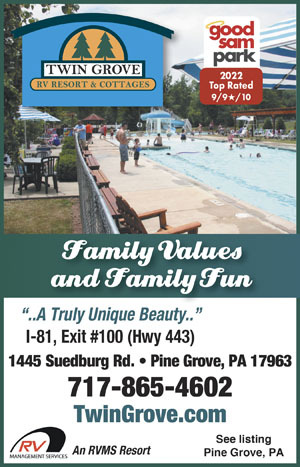 Twin Grove Resort is a 100 acre destination property in the rolling Blue Mountains of central Pennsylvania. Spacious full service RV sites with amenities & events to suit all ages. Family values are the core of our Resort.